I can't tell you how excited we are to actually have our very own bathroom. We've been sharing our current 5x8 bathroom with Emma and our guests for the last couple of years - this bathroom will be a complete luxury for us. Like most things for the new addition that we've picked out, I have for the most part, always known exactly what we want. For the bathroom that means some marble, bone subway tile, wood vanity, polished nickel fixtures, brass pulls and accents and mostly cream painted walls. Trying to figure out where all of these finishes will exactly play out is a little more difficult. I'll talk more about finish choices, what I need your help with and more below. For now, let's talk layout - something that was really important for me... and tricky. I found (like most things during this process) that most layout designs offered up were not what I was looking for. It seemed like everything was lined up and push against each other. For me, that felt too cramped. As I said, I want our bathroom to feel airy and bright - and since it is not that big of a room, I had to do that with smaller scale things - no lengthy vanities or huge scale tubs and showers. 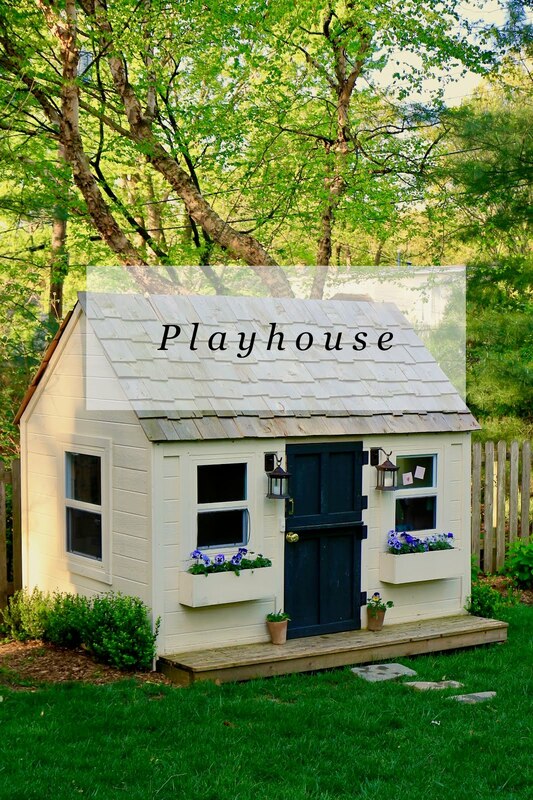 Our architect assumed that I would require the 6ft vanity that most bathrooms feature, and told me that there was no way we could squeeze a master bathroom and bedroom along the back of the house (only 29ft wide) that was lined with windows. 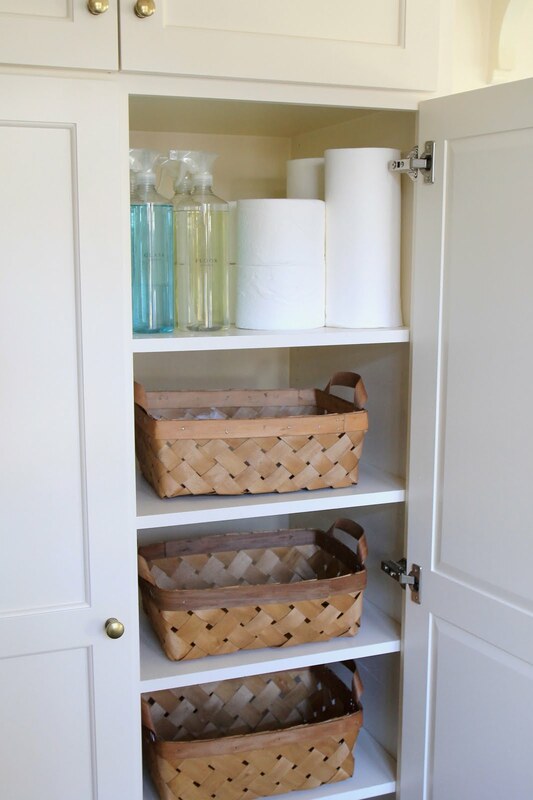 However, I knew that my vision for the bathroom, one with airy windows and tons of light was much more important that being able to store 10 years worth of old makeup in my vanity. Because Mike and I are pretty minimal with our primping, it was an easy choice. Our architect also assumed that when I said tub that I meant something that would be 72+ inches long with jets and bubbles and he told me it could never work. My persistence paid off. I drew it up myself and included everything I wanted. It took me forever, but totally worth it. 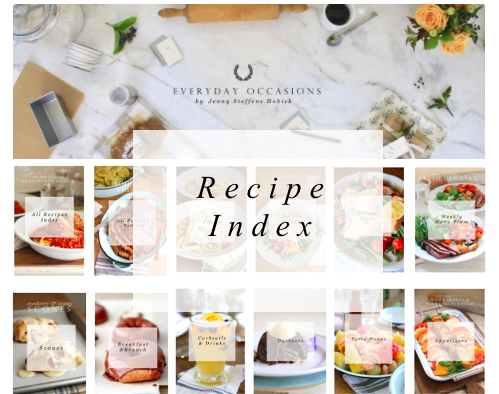 I really love how the layout ended up - it is everything I envisioned. Here it is. As you can see, our Master Bedroom opens up to our bathroom with french doors. Because neither room is too too big, the french doors will make each room feel bigger. I wanted the french doors to be perfectly aligned with the tub under a big window that would draw your eye in - all the way from the bedroom. I feel like this will also make the rooms feel more generous. I had a vision for a furniture looking vanity that was not butted up next to anything else, but centered along the wall with windows on each side. Mike has always wanted a big, glass door shower for as long as I can remember, so that was also on our list. I also love the wood floors in this photo... am I crazy? I really want wood floors, but have been told that they won't hold up. 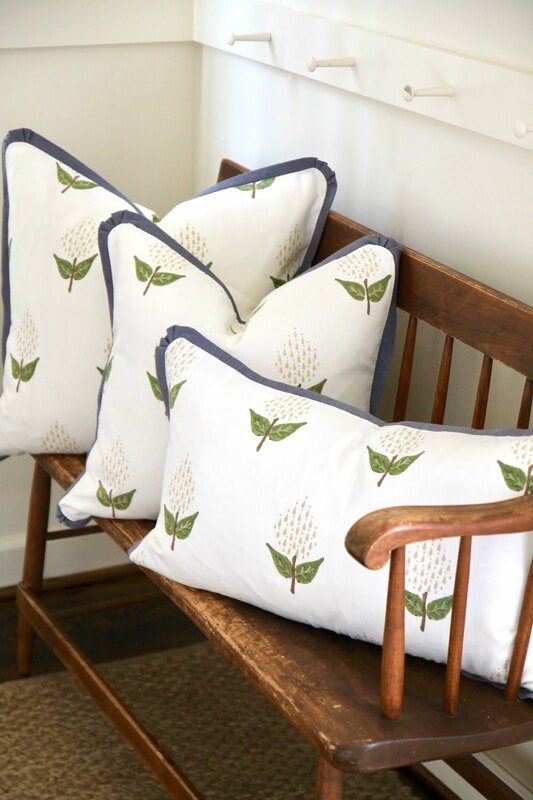 I've seen them in several lovely homes and love the look and warmth they provide. Does anyone have any feedback on living with a wood floor bathroom? I'm so tempted to do a cute wallpaper with a small print... I love how charming it makes this bathroom look. I love the subway tile and glass door of the shower. I also love the wood paneling - that will be a decision made later in the process once we see how the rest of the budget is holding up during construction. 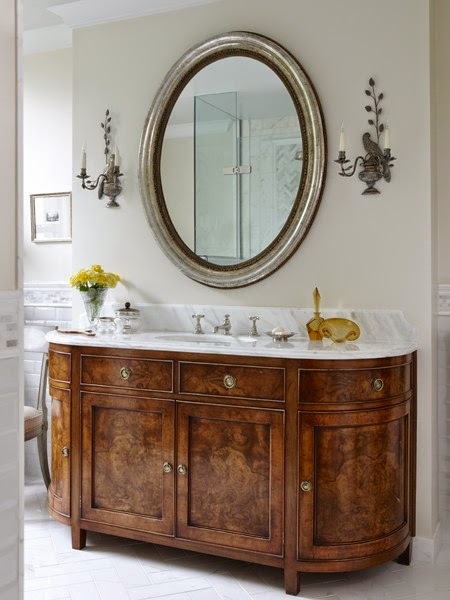 Here is a very elegant wood vanity with marble top - ours wouldn't be this fancy, but I like the colors of the wood + marble. The other floor material I am considering (if I'm convinced that wood is a bad option) is a 2" hexagon marble tile. I like the slightly enlarged scale of the classic 1" hex and think it would be a charming addition of natural stone. I like the honed (unpolished/tumbled) versions best to give it a less flashy appearance. Really love this look. But we won't have a fancy chandelier, but a brass lantern instead. 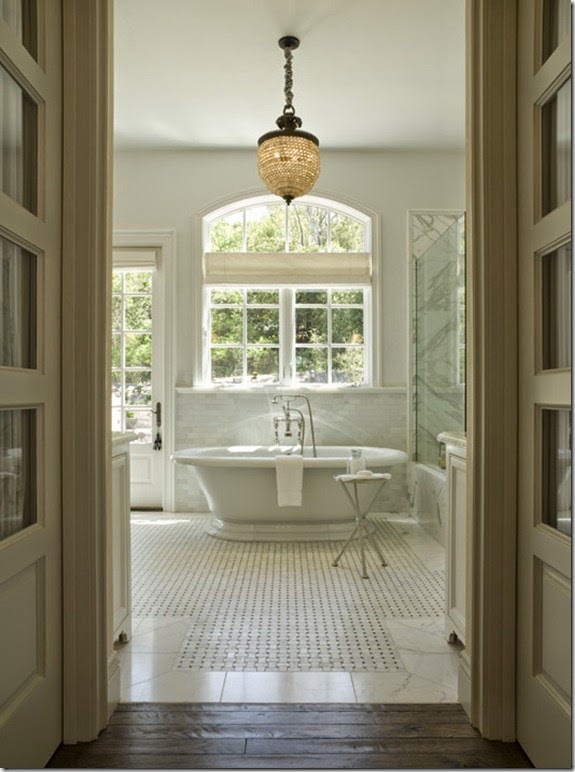 *Links and sources to photos can be found, here, on my Pinterest Master Bathroom & Bedroom Board. The main bathroom in my parents home has wood flooring that has really stood up to the test of time. 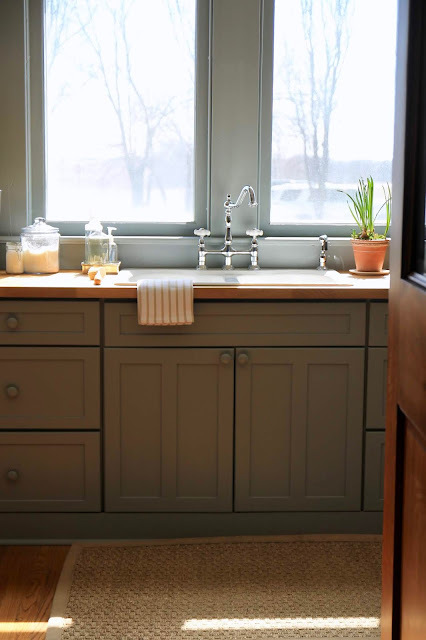 For 26 years that bathroom was used by two adults and four kids and although there has been a little wear and tear, in my opinion it only adds to the charm of the wood. As long as you use a matt in front of the shower and bath you shouldn't have a problem. Love hearing that! I talked to our contractor yesterday about it and said it should be fine as long as we put in a heavy duty exhaust fan to keep the moisture out. He also recommended setting the fan on a timer to make sure it always runs for a minimum amount when we use the shower, instead of just when the lights are on or when we're in there. Have you looked into the new ceramic tile that looks like wood? We saw it in a lot of homes in the parade of homes last year and it seemed like a great compromise for the warmth of wood (maybe include radiant heat underneath for actual warmth?? ), and the durability of tile. 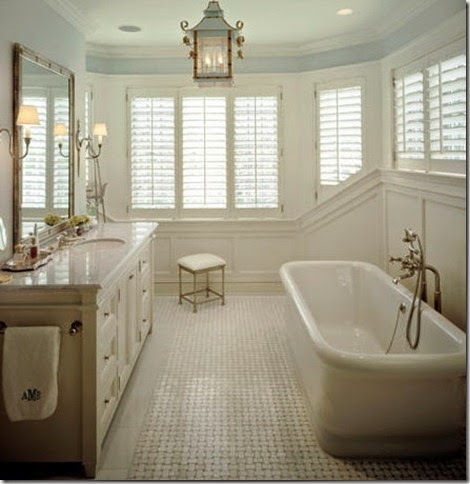 I have no experience with a wood floor in a bathroom, but I love that basket weave tile. Lovely. I love the character wood food brings to a bathroom, but I don't think your wood vanity will make much of a statement with it. I like the contrast of the wood with the marble. You could do wood floor and white vanity. 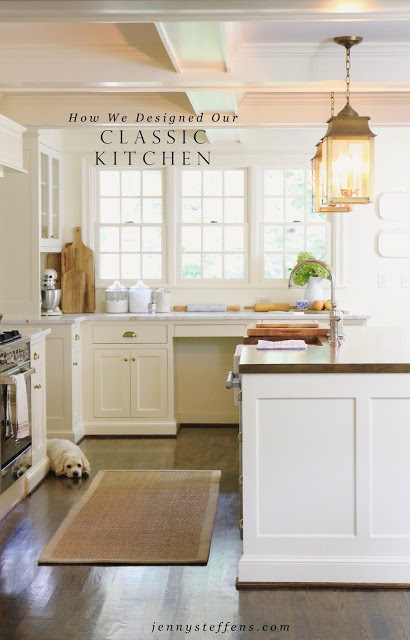 Just my two-cents :) We have such a similar remodel story in our Cape Cod in Old Leawood! Our project started last year in Sept and ended in March...and our builder's name was John :) After a year of working with an architect I ended up getting my own grid paper and planing the entire remodel. You are the one living in the space so you will know what's best. Trust your gut! We did a white hex with grey grout in the kids bathroom and love how it turned out! I do think I am going to have to stop following you blog because it's going to make me crazy in all the decisions I should have made!! :) Best of luck to you! Hi Jenny, We are in full blown construction mode here .. demoing 80% of a thirty year old house while living on site. Our upstairs is almost complete and the downstairs is happening as I type and we are hoping to wrap this up by mid October. Our bathroom is similar to the one at the top with the vanity in the center of the two sinks. Having had both subway tile and wood in bathrooms before, we decided to go with marble tile with a black cut out. The wood was a problem around the base of the toilet. I'd think that with small kids it might be tough to clean? Love the standing tub! We tried to make that work in one of our bathrooms. Unfortunately it didn't come together. Sounds like you are moving along here and everything will be perfect when complete! We have a wood floor in our powder bath and I wouldn't do it again. The entire floor had to be replaced when a construction worker accidentally broke a water pipe in there. Recently the toilet overflowed and made another big mess. Thankfully we were able to salvage the floor. I will definitely be replacing it down the road though. I have a dark wood floor that is in our master bedroom and continues in to the bath-it visually makes the space look bigger than changing flooring at the threshold, and it is terrific-I love it. The tile that looks like wood is another good option. Another idea- pocket doors are an option for the entry to the bathroom. I found some budget friendly etched ones that turned out beautiful, and it would give you extra wall space for furniture. We are doing a home build as well and I have come across the same dilema... however... they make wood tile! It is truly a tile, but made to look just like wood. I think you can find examples at Home Depot even? It looks very similar, but without the water on wood issues! 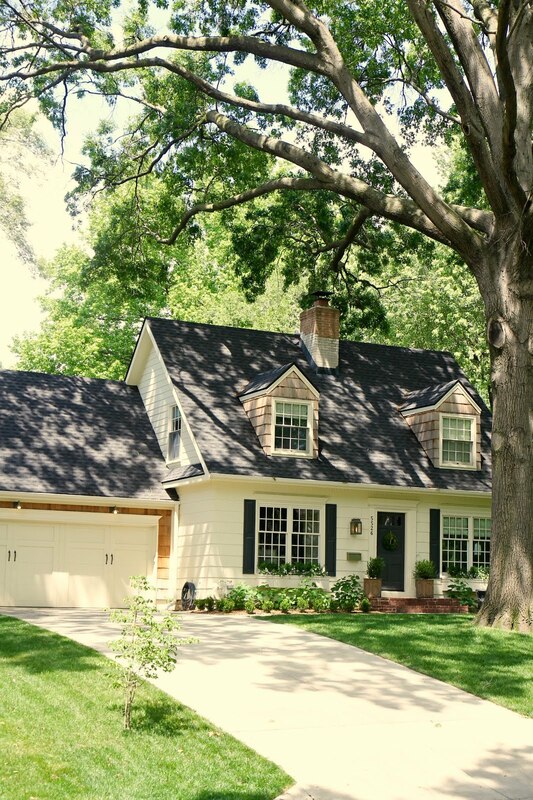 Can I just say that I am so happy that you are re doing your home just as we are building... So many beautiful ideas. Now I am going to talk to our contractor about wood floors in the bathroom! 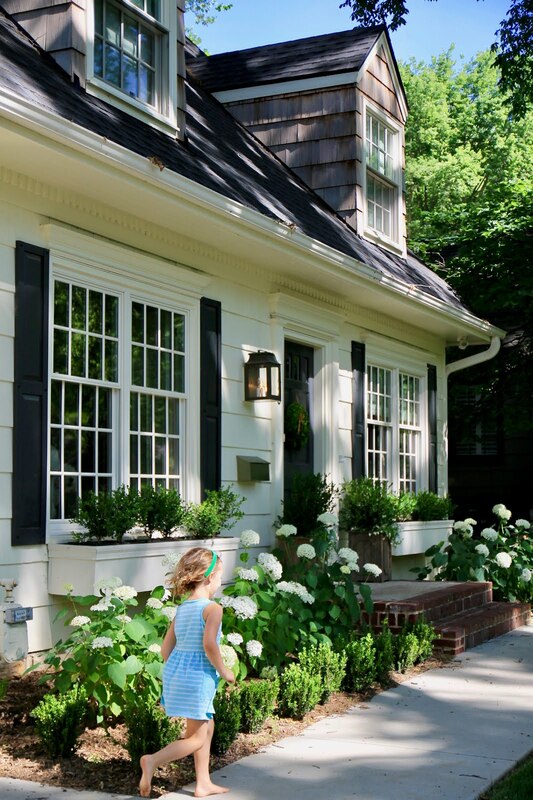 At first glance I am drawn to the hexagon (and doing something similar in my 1/2 bath) but the basket weave is so timeless and just something you don't see a lot. Happy Construction! I love your ideas and know it will be wonderful. I think wood floors would take some vigilance with making sure water doesn't sit on the floor. I have wood floors in my kitchen and have for years, there has never been a problem and there's plenty of water that gets splashed from time to time. You have such tasteful and stylish designs! Im sure whatever you end up deciding will look beautiful! However, I would recommend going with the marble tiles. Not only will they be more durable and last longer, but they will also allow for the wood vanity to stand out more. This past summer I visited friends in South Hampton Beach (they live in the type of house we only dream of living in). Anyway, all of the designer bathrooms in the home had either marble or some other type of tile. While visiting, we also went to a show house in East Hampton (which is basically an open house for a mansion that is for sale and all the rooms in the house are decorated by a high profile designer). This house also had either marble or other tiles in the bathrooms. These houses displayed a very similar taste to yours and although there were no wood floors in the bathrooms, there was still a lot of character throughout! If you'd like to see pictures Id be happy to send you some as well! Hope this helps! I love the idea of wood floors, but if that makes you too nervous, I vote for the tile that looks like wood. I've heard you can't even tell the difference. I am looking forward to your remodel!! We put hardwood in our masterbath when we renovated in old Leawood 2 years ago. Our bath is similar to your design: walk in shower w/glass and a pedistal tub. There is the occational splash of water, but we haven't had a problem at all with the wood. I wipe up big splashes (which I'd dowith tile for safety anyway) and use rubber backed bath mats. Our electrician put a sensored exhaust fan in the shower so it runs when necessary and we don't have to mess with turning it on or off -- love that! People don't hesitate to put wood in a kitchen, which has the same water risk, so why be hesitant putting it in a bath? It is beautiful, timeless and doesn't have grout lines!! We remodeled our home last year and decided to put wood floors in the master bathroom -- our builder kept encouraging us (I had the same concerns) and he promised we wouldn't regret it. So far no regrets! And I love the warmth it adds to our bathroom. It's only been 18 months but we have had zero issues with the wood floor. We also installed a shower just like the one your husband wants. It is very well sealed while we shower and once again, no issues yet. We are diligent in checking to see if water happened to splash out, and if so, we wipe it up once we exit. Our builder actually suggested NOT to put a mat down with a rubber bottom on the wood floors in front of the shower. It is bound to get damp as you exit and hold some of the moisture which will then eventually make its way to the floor. Instead he said to use a towel-like mat and simply put it down when you use the shower. Then we wipe up the excess water and hang it to air dry -- not on the floor. I hope that makes sense. I love your style! I vote for basket weave tile so that your vanity will stand out but either way its going to be gorgeous. Very exciting for you guys! I have an unrelated question about the square space between the tub and the shower. What is going in there? Would it not be easier to push the shower into that recess? 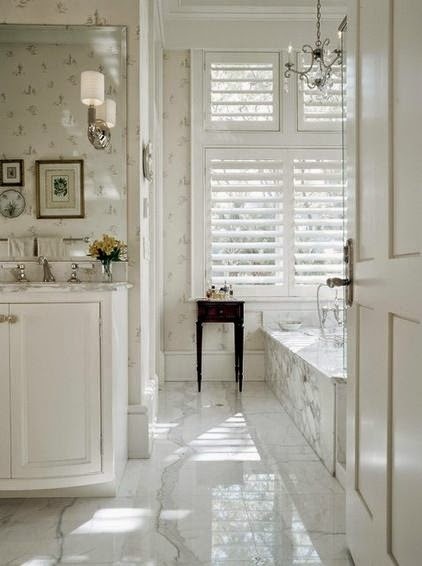 I am in agreement with the classic look of basket weave marble for the floor in your bathroom. The design and material is absolutely timeless. It looks gorgeous with a stained vanity or painted. If stained, the vanity will stand out beautifully. The honed hexagon marble is lovely, too. As a designer, I would shy away from the wood flooring in the bathroom unless you're prepared to keep it completely dry at all times. I like a bathroom to function a little better than the carefulness of tending to a surface that cannot get wet. Wet warps in a heartbeat. A damp bath mat will cause problems not only to the finish, but also the grain of the wood. Marble will allow you to fully use your bathroom without the worry. As they say, form follows function. But you're not compromising form with beautiful marble flooring. :) Also, wood absorbs odors more... around the toilet. Just things to think about. I also noticed the space between the platform tub and shower. I realize you can't move the shower in that space without compromising the shower head and door; but, perhaps you could add some lovely built-ins from the tub side to house towels and pretties for the tub? Again, just something to think about. Great job in keeping a journal of your wishes. Have fun watching your vision come to life! It will be spectacular! Jenny, did you consider the newish tiles out that mimic hardwood. A friend of mine just used it in her downstairs den and kitchen because they have an outdoor pool and a 4year old. She didn't have to want to keep yelling about dry feet on her floors, but still wanted the look of hardwood. Her tile guy suggested the tiles with a very small grout spacing and it very much gives the look of hardwood. I recently used in a bathroom the Honed 2inch hexagon marble, bought from a company online that was great and even showed me the marble pieces they were sending I could approve the appearance and veining that I preferred, they stated the marble was from Italy and I love the finished product. I am not as big of a fan of wood floors with a wood vanity, I think the idea of a wood vanity and marble floors will be so clean and a great combo of classic and elegance. Can't wait to watch the process unfold, let me know if you would like information or pictures of the floors that I purchased (I too chose subway tile, but with polished nickel). 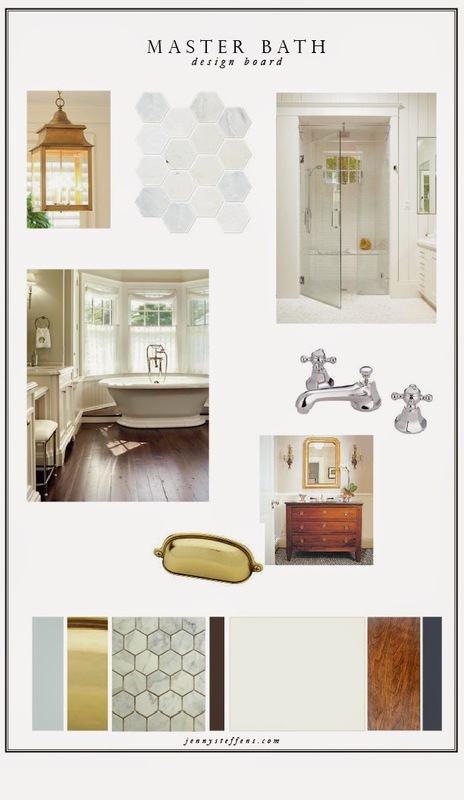 I love hardwood, but for the bathroom I'd go for the hexagon tile. When we built our home here 18 years ago, our contractor thought we were crazy putting wood floors in our bathrooms. 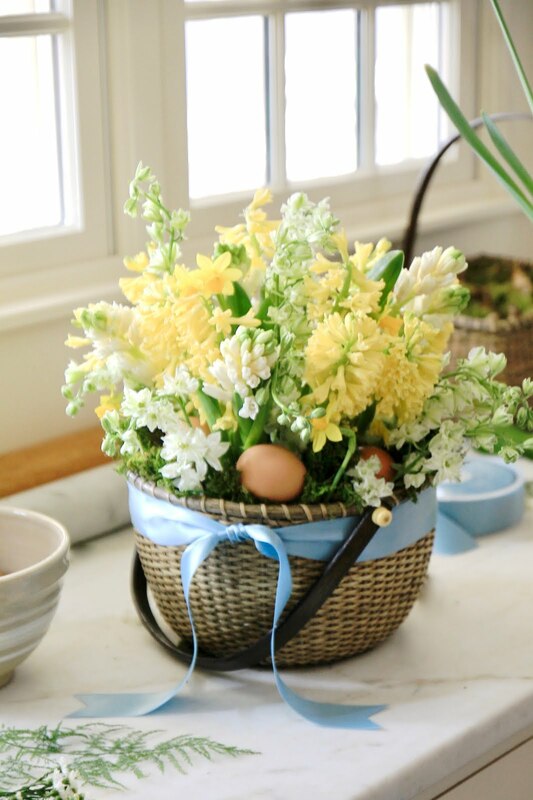 They have held up wonderfully (with 3 young children growing up here) and I would not use anything else. I love the floors. Our previous home (which we also built) had tile floors, and it was soooo much work cleaning the grout. I clean my heart pine floors (that have been sealed with polyurethane) with Mr. Clean and water. We even put wood floors in the bathroom of the room we have just finished over the garage. So my vote is definitely for the wood floors. We have 100 year old fir wood floors (refinished 10 years ago) in our one bathroom for 2 adults and 3 little children so it gets a LOT of use from sloppy bathers. And I love them! I love the softness - who wants a child to slip and fall on hard tile? - and it's so easy to clean especially when I can wash them the same time as the rest of the floors. We have had a few potty accidents but I haven't had a problem if I wipe up fast and clean. I feel it makes the house and bath feel so authentic especially since in our case they are original to the house if that's the look you are going for. 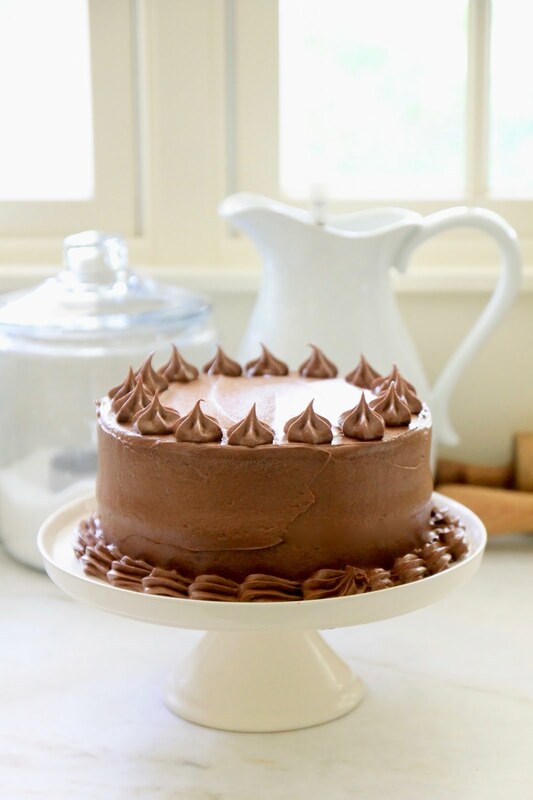 Beautiful choices and inspiration! Please don't do wood floors in bathroom. There are lots of new ceramic tiles that are long that look like wood and are probably a lot easier to clean. I love the hexagon tiles you picked out too but go with a dark grout. The darker the better as the grout gets dingy looking. 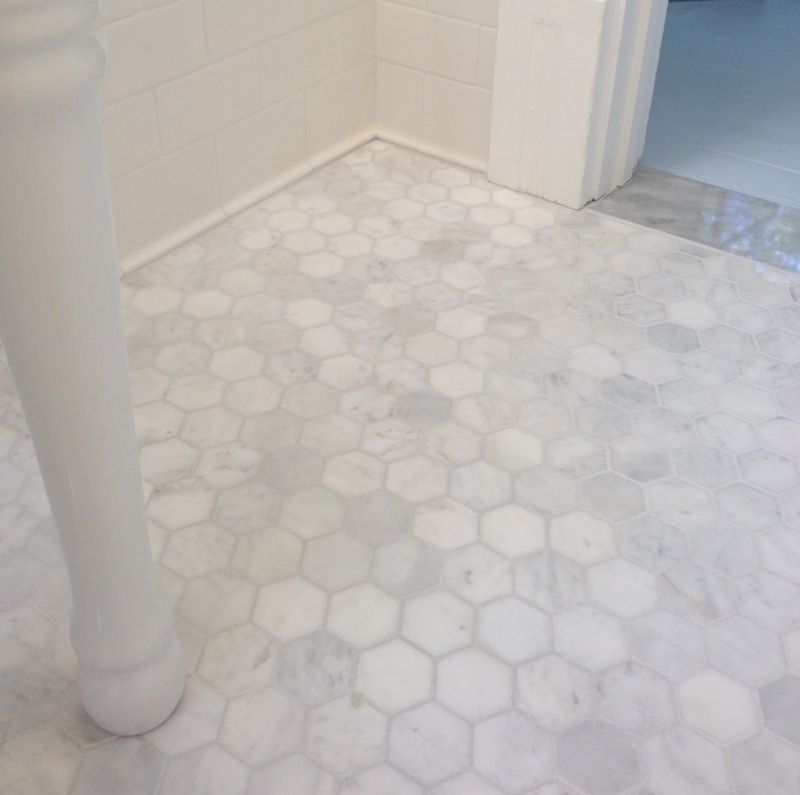 I have used the hex marble floor several times, and just used it for one of my best friends basement remodels. When a flood in the upstairs caused water to drain down into the rooms below, the marble could NOT be cleaned up! It had to be torn out, (they chose to replace with a different tile), before the renovation was even finished. Wood will also have its own upkeep woes. So I say, just go with what you love! There will be pros and cons to any flooring you install. You are such a meticulous person anyway.....anything you choose will work out beautifully. The one piece of advice I would give for certain, is NO white grout on the floor. Shower or tub surrounds are fine with light grout, but you would HATE it on the floor. Just my two cents. Have a great day! Jenny, just renovated our bath using very similar materials including a wood floor. According to our contractor, in an adult only bath with the rigt installation and care, wood is just as durable as a stone tile. We chose wood and it flows wonderfully from the master into the bath, making our tiny bath feel much larger and like a suite. Would be happy to answer any questions. They do make ceramic that looks like wood. You might have to look around a little to find a place that carries enough variety to see if you like it. 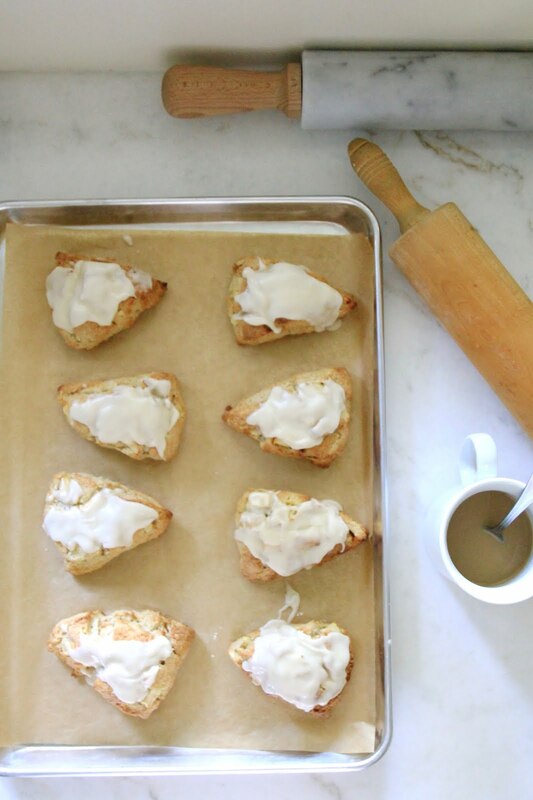 Start by looking on Pinterest. If you did do wood floors, would you switch to a white or painted vanity for contrast? Personally I'm in love with the basket weave tile. For the floors you could consider the wood toned tiles as an alternative, it would give you the warmth of wood without the risk of warping and damage. How exciting! You know they make tile that looks like wood now - you can get the look of wood and the durability of tile - without too many grout lines to clean (I'm all about easy to clean!) What every you choose, you have wonderful taste and I know it will be beautul! Jenny, I can't wait to see the results! You obviously are strongly opinionated on your design, so if you want to go wood, I would trust your gut. However, I agree with the above statement about the wood vanity having more contrast against tile - I think that look is best. Plus, although I love the look of warmth in our own 1929 home, I love our light and airy bathroom (which is all creams, subway tile, white/gray marble, and hex floor). A little forward thinking: We love our stand-alone BainUltra tub. I highly suggest looking into these when you shop tubs; the jets don't shoot out water, but air, meaning there is less cleaning and chance of "ick" in the jets. It is truly like a full massage when you run it:) Oh! And make sure to do a dimmer on your big lantern. 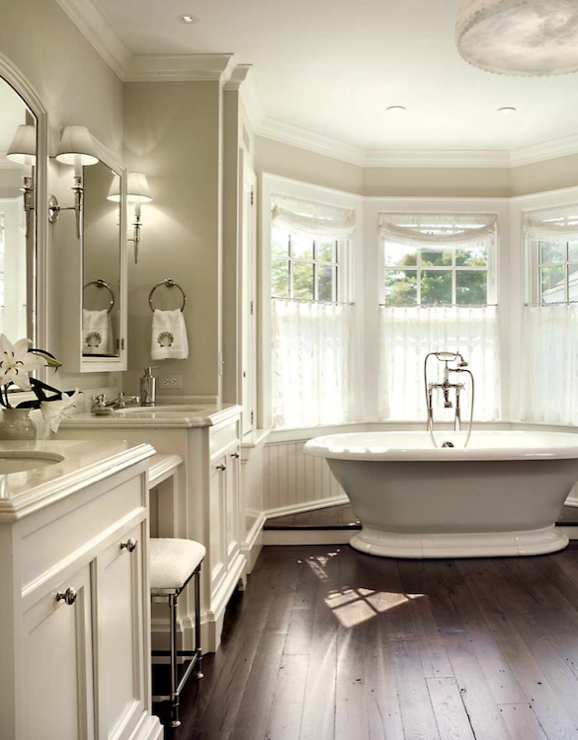 You will enjoy turning off vanity lighting and dimming that chandelier for a relaxing soak! GO WOOD! I was talked out of it, and though my bathroom is twice the size of yours, the wood looks and feels so much warmer!! This is going to be so beautiful! I love your choices! 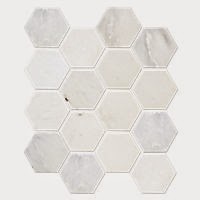 We went with the marble basketweave in our master bath remodel and I LOVE it everyday but I have a good friend who is using the hex marble as we speak. So far, they are both lovely to me, I find the hex slightly more modern but it would balance a wood vanity well. If you love the wood though go for it! Personally the wood-like tiles don't give the same warmth or feel of a beautiful oak or pine floor so I love the choices you posted. Best wishes, I can't wait to see what you decide! They make a wood tile that would require very little grout joints, really making it look authentic. If you like the warmth of wood over tile, but worry about water on the real wood, consider adding heated floors. You can do this with the tile, but not the wood. Of course, a heated floor on honed marble is SO WARM! I love all your ideas. Your bathroom is very similar to one I did 2 years ago. I do have hardwood in my bathroom but the layout is slightly different. I was able to design the space so that the shower and toilet were in the back (where I put marble on the floor, and my tub, and vanities were closest to my bedroom where I continued the hardwood. I don't use the tub much so the wood is not a problem in that area. I'm not sure the wood would hold up as well in the shower area I have.